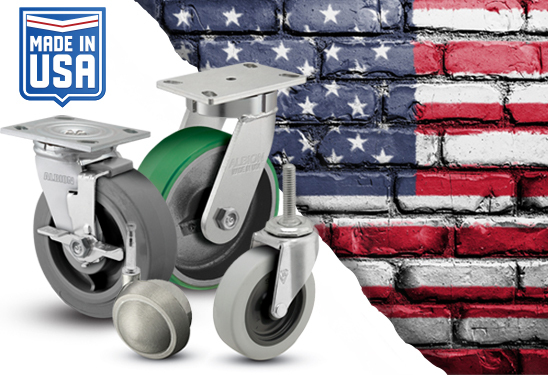 For those unfamiliar with the broad world of casters, we understand that navigating the available options may seem daunting. We hope that the definitions presented on this page will help provide a better understanding of various terms and concepts regarding casters and wheels. Caster Type – describes the main structure and functionality of a caster. 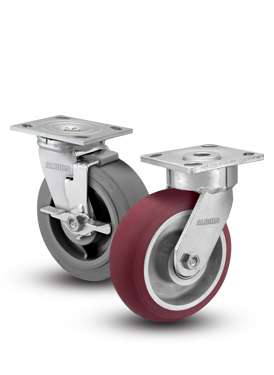 A caster is divided into two main parts: rig (mounting option, raceway [if swivel], legs), and wheel (wheel, bearing, axles). A caster may include optional brakes (as add-on accessories, or integrated into rig). Each name reflects specific industries or how the brake itself functions. Rigid casters may even have this type of brake. Other brakes will engage with the caster wheel and the swivel mechanism to prevent any motion. We call this style Total Lock brakes. Swivel Locks – Swivel Locks are accessories which will engage with the swivel mechanism, preventing swivel rotation. A swivel lock can ease control when long, straight-line movement is required. Swivel locks may be able to be paired with wheel-contact brakes. Fastening Type – describes the means by which a caster attaches to the product to be moved. Top Plate – A horizontal plate for attaching a caster to equipment. Plates spread the load over a larger area, and often require a large flat surface for attachment. This is one of many fastening types for smaller casters, but the main fastening type for larger casters. Threaded Stem – This fastening can be threaded directly into a receptacle on a unit, or pass through a frame and be topped off with a nut. Threaded stems come in a variety of diameters and lengths. Grip Ring – A steel ring compresses when pushed into a socket or pre-molded hole, expanding to cause friction between stem and socket/hole. This friction holds the caster in place. Grip Neck – A common fastening for wood furniture, grip neck stems are often used with sockets with retention lips that lock the fastening in place and prevent it from falling out. Hollow Kingpin – This fastening has an open hole to allow a user-supplied bolt to be threaded through and attached to a product. Additionally, a threaded protrusion from the product may be used, capped with a nut. Fastening Size – describes the overall size of the fastening of the caster. Top plates measurements indicate a length and width. Threaded stem measurements follow 1/2"-13UNC x 1", which represents the stem diameter, number of threads per inch, and exposed stem length. Grip Ring and Grip Neck stem measurements indicate diameter and length. Hollow kingpin will indicate mounting bolt size. Mounting Bolt Size – manufacturer recommended dimensions of bolt size for fastening top plate and hollow kingpin casters to equipment. Bolt Hole Spacing – the distance between bolt holes in top plates. On some top plates, this is static; on others, bolt holes are slotted with variable measurements. 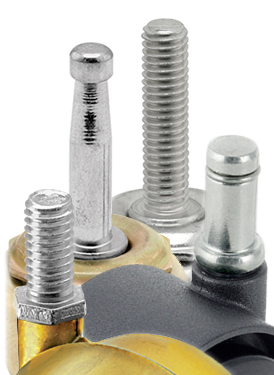 Slotted bolt holes allow for an easier replacement to existing equipment. When attaching to a product, the bolt should be tight enough to not allow shifting within the slot. Wheel Diameter – the overall diameter of the wheel, measured from outermost surface across the center to outermost surface. 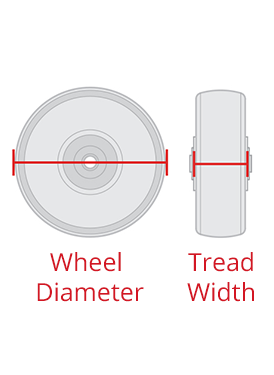 Tread Width – a measurement of one side of the wheel to the other. Together, wheel diameter and tread width can impact the abilities of a wheel or caster. Larger tread widths or wheel diameters often can support heavier loads. Together, wheel diameter and tread width may make up their own measurement. If you’ve ever heard someone refer to a caster or wheel akin to “6X2” – they’re usually referencing the diameter and tread width. In this instance, a 6-inch wheel diameter with a 2-inch wide tread. Swivel Radius – A circular measurement used to determine caster clearance. Swivel Radius measures the distance from the center of the swivel mechanism, to the further reaching point on the caster. This point may be the wheel or an added accessory (i.e., added brake). Swivel Lead – A fixed measurement from the center of the swivel mechanism to the center of the wheel axle. Swivel Lead measurements can help determine caster functionality and ease of use. Capacity – Also referred to as Load Rating, a caster’s capacity refers to the tested and approved weight a single caster can hold. To determine your minimum required caster capacity, take the total weight of the object to be moved (include cart and all additional loads), and divide this by the total number of casters needed, minus one. Reducing the caster count in this equation helps build a capacity safety buffer. Take for instance a standard platform truck which, when fully loaded, will weigh 1,000 pounds. It has room for 4 casters. Divide 1,000 pounds by 3. At the minimum, you would want to search for casters with a capacity of 334 pounds each. Finish – describes the coating or structure of the caster rig. Zinc - Zinc-plating on casters (typically made from standard steel) is our standard finish, and provides added corrosion resistance and strength to the caster rig. Chrome - Triple-plating process which provides an aesthetically pleasing, resilient finish, perfect for clean rooms and medical applications. While more affordable than stainless, chrome may still rust. Stainless Steel - Unable to rust, stainless steel is the perfect material choice for any application where exposure to chemicals or wash-downs is required. 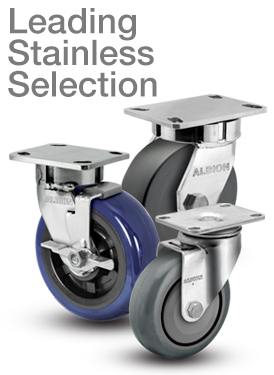 Stainless steel casters also utilize stainless steel components (ball bearings, axles, etc). Nylon - Injection-molded nylon casters are ideal for many single and twin wheel medical applications. 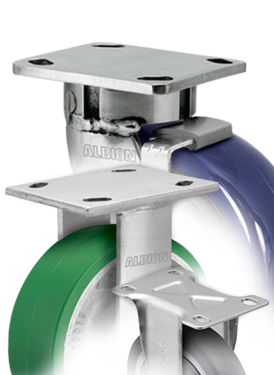 Resistant to rust, nylon casters may even be constructed with stainless or non-magnetic components. Wheel Type – describes the material of which a wheel is manufactured. Polyurethane - Polyurethane wheels are open cast, or are injection-molded to cores. Each unique formula is designed for specific benefits, including ergonomics, shock absorption, noise reduction, debris rejection, and overall durability. Polyurethane also includes our Eagle, PolyKat, Vipor, X-treme Plus, and “K” Wheel options. Rubber – Rubber wheels provide exception floor protection, shock absorption, and may reject metal shavings and floor debris. Various options can be found, including non-marking formulas, no-maintenance/semi/fully-pneumatic, and a variety of durometers and color choices. Various names may describe our rubber wheels, including Monotech, Neoprene, QuickStart, and X-tra Soft. Pneumatic – An air-inflated rubber wheel, akin to automotive or bicycle tires. 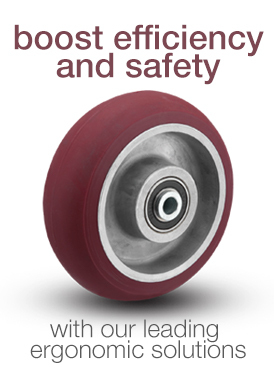 Pneumatic wheels can provide additional cushioning to loads against uneven surfaces. As such, they are excellent for environmental changes (especially inside to outside, common in hospitality). Pneumatic wheels do require regular maintenance and air pressure evaluation. Semi-Pneumatic – Rubber wheels which function like pneumatic wheels, but are filled with a cushioning material. Semi-pneumatic wheels do not require the evaluation of air pressure and are resistant to punctures. Metal – Metal wheels offer the highest capacities, temperature resistance, and strength for the most abusive indoor/outdoor and floor conditions. A range of materials is available, including Cast Iron, Ductile Iron, Sintered Iron, and Diecast Zinc. Phenolic - Phenolic wheels are constructed of heavy macerated materials impregnated with phenolic resins. These are molded under high heat and pressure to produce a quality, but economical, industrial wheel. Nylon - Offering high load capacities and greater floor protection than metal or phenolic, nylon is a perfect fit for helping reduce wheel noise or in clean applications requiring frequent wash-downs. Nylon wheels include our Trionix Polymer wheels. Polypropylene - Injection-molded from a blend of thermoplastic polymers, Polypropylene wheels are an economical and light-weight option, with comparable load ratings to rubber wheels. Often referred to as Polyolefin. Our “RT” and Retort wheels are both Polypropylene wheels. Bearings – objects utilized to reduce friction and improve movement. While caster raceways do indeed have bearings, the description of a caster’s bearings typically refers to the wheel bearing. Ball (also Radial Ball) – Shielded ball bearings pressed into the wheel hub. These are a good, low-cost bearing option. Ball bearings may be Stainless Steel. Delrin – a DuPont™ engineered plastic, extremely durable under a wide variety of extreme conditions, especially where wash-down and steam-cleaning is required; self-lubricating. Plain – Most affordable option, no bearing is used. The wheel rotates directly on the axle. Results in increased rolling resistance. Precision Ball (also Dual Precision) – Completely sealed precision ball bearings held in a metal-spaced ring between two hardened raceways. Maintenance-free; offers lowest rolling resistance of all bearings. An ideal ergonomic solution. Precision ball bearings may be Stainless Steel. Roller – Standard in most caster applications, roller bearings consist of a cage enclosing hardened steel rollers, inserted into a hardened thermoplastic or steel case. Roller bearings may be Stainless Steel. RoHS Compliant - casters which meet the Restriction of Hazardous Substances directive for manufacturing without the use of hazardous materials. Low Profile - casters with a small overall mount height. Often utilized when objects need to move but do not need to have much floor clearance. Common applications include business machines, copiers, refrigerators. 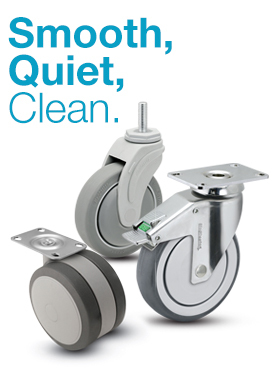 Maintenance Free - casters designed with precision bearings that do not require lubrication during caster life. Maintenance-free casters do not guarantee from failure and should, like all casters, be regularly examined for signs of wear. Floor Protective - casters with wheel materials that are proven to reduce the chance of damage to floors. These wheels are less likely to leave scuff marks and may even reject floor debris to prevent accumulation of damaging items. Ergonomic - casters which are designed to facilitate movement and reduce work strain. 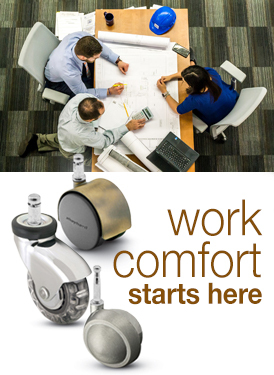 Ergonomic casters may have extended swivel leads, donut tread wheels, precision bearings, or combinations of the above. Donut Tread - a rounded wheel tread (instead of flat); provides additional benefits to turning and ergonomic usage. Dual Wheel - a widened caster fork contains two wheels on the central axle, providing higher load ratings and better stability compared to equivalent single wheel casters. 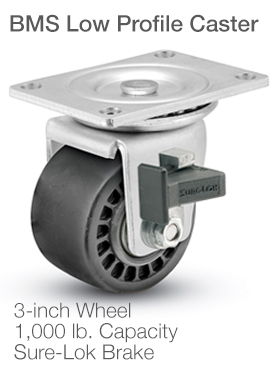 Twin Wheel - often nylon or thermoplastic casters with two wheels attached to outside of central caster body. Twin wheel casters provide stability and easy turning capabilities in a decorative package. Thread Guard - plastic or metal disc which covers wheel hub, bearing, and exposed axles. Utilized to prevent debris, such as threads or other dropped items, from entangling with the wheel or axle. Spring-Loaded - casters which are manufactured to allow springs to provide shock absorption for loading and movement. High Temp - casters which are rated to withstand high temperatures. Ideal for usage in autoclaves, ovens, and other high-temperature situations. NSF Listed - caster is approved by NSF International for usage in the foodservice industry. Note: casters with thread guards are never NSF approved. Never Flat - these products utilize Semi-Pneumatic wheels which provide the benefits of pneumatic wheels without the risk of flat tires.